Monday January 7th 1895 The boys went to the timber for wood. I was busy all forenoon. I did the churning alone. They were home in time for an early dinner and Will and I went to town. I was up in Otts office awhile and did some errands about town. I got supper over and read in the evening. 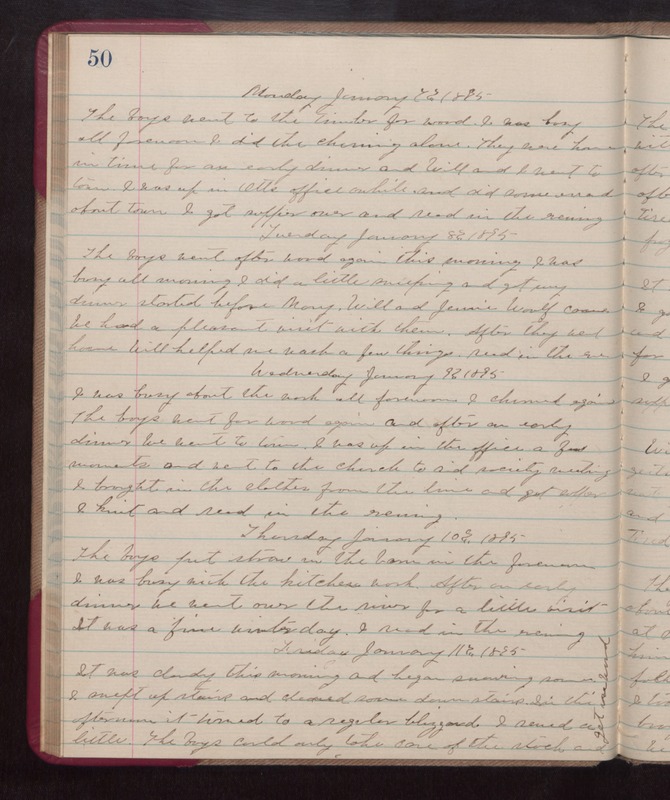 Tuesday January 8th 1895 The boys went after wood again this morning. I was busy all morning. I did a little sweeping and got my dinner started before Mary, Will and Jennie Woolf came. We had a pleasant visit with them. After they went home Will helped me wash a few things. read in the eve. Wednesday January 9th 1895 I was busy about the work all forenoon. I churned again. The boys went for wood again and after an early dinner we went to town. I was up in the office a few moments and went to the church to aid society meeting. I brought in the clothes from the line and got supper. I knit and read in the evening. Thursday January 10th 1895 The boys put straw in the barn in the forenoon. I was busy with the kitchen work. After an early dinner we went over the river for a little visit. It was a fine winter day. I read in the evening. Friday January 11th 1895 It was cloudy this morning and began snowing some. I swept up stairs and cleaned some down stairs. In the afternoon it tuned to a regular blizzard. I sewed a little. The boys could only take care of the stock and get in wood.